Sales of Michael’s Memorabilia Exploded – Did you get your piece of Jacko? 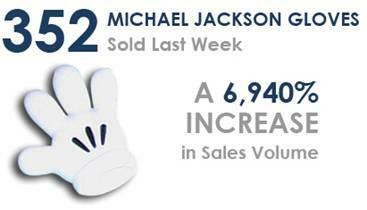 Both the Thriller LP and Michael Jackson Dolls have increased in value dramatically this past week. A copy of Thriller can go for nearly $70 on eBay, or so Vendio eBay Market Research says, compared to the $13 it was getting before the King of Pop passed. Michael Jackson dolls. Yes, they unfortunately exist. Although its cliché, call it an “action figure,” and it will pickup and extra $10, bringing home an astounding $120. Who knows if anything from the 80s can truly be “vintage;” but if it’s added to the item title, there is an 88% chance it will sell on eBay. Whether it’s a doll or “action figure” it’s still fetching over 370% more than it would have any time in the previous few months before Michael moved-on. It also looks like there is a MJ glove fad on the horizon. 352 of them sold last week on eBay compared to the 5 per week reported by Vendio Research in weeks prior. If prices of Michael memorabilia are just going up, up, up, what is a fan to do? Well, a real fan would step-up and buy a Michael Jackson gold record. They are currently undervalued by about 25% when compared to sales in weeks before he died. For some reason if a gold record doesn’t satisfy a fan’s Michael appetite, they should think about buying Michael Jackson: Moonwalker, the movie not the video game. It’s not nearly as cool as a gold record, but it’s only $20 now vs. $28 in weeks prior. If you would like any more eBay transaction data about Michael Jackson or anything else, check out Vendio Research. You just can’t Beat It. It’s a simple yet powerful application that analyzes millions of past eBay transactions to provide data on individual items including average sales prices, sales volume, and keyword metrics. The above statistics were gathered from Vendio Research and can be used easily to determine selling strategies and opportunities on eBay for Michael Memorabilia or any product you have. So start snooping and figure out what that film of Farrah you found is really worth. This entry was posted on Thursday, July 2nd, 2009 at 10:25 am	and is filed under eBay Marketplace, Vendio Applications. You can follow any responses to this entry through the RSS 2.0 feed. Both comments and pings are currently closed.